You may have lots of questions. Some of these will be answered in the documentation that we have on this website and on the architect's drawings on display in the church. 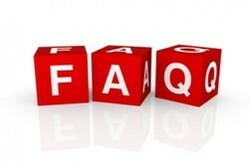 However we have put together a list of some of the questions that you may have. The pews that form the bulk of the seating at the moment were installed by the Victorians in the 1860s during the last major changes to the building. They are not particularly important examples of Victorian pews and in their own right do not have any special historical significance. The plan is to remove these Victorian pews and their platforms from the nave to make way for under-floor heating, a stone floor and flexible seating on wooden chairs. The pews which are currently in the north and south aisles are of an altogether different vintage and significance, with some parts of these pews dating back to mediaeval times. They are in varying states of repair and we plan to restore and retain the best of them, repositioning around the perimeter of the building. We will continue to hold a wide range of services from informal Praise & Prayer evenings with contemporary Christian music to traditional occasions such as Christmas Carol services and Easter events. The only difference is that we will be able to arrange the church to suit the event - and you will have a much more comfortable seat! We also hope that the wider community will want to use the rooms for meetings and other functions (see earlier question). Historical records indicate that having a gallery at the west end of the church is not a new idea. Before the Victorian re-ordering of 1864-5 there was a gallery at the back of the church capable of seating over 100 people. The proposed gallery has a number of functions. Firstly it provides for an enclosed space at the rear of the church for small gatherings and for serving refreshments after services and at events. It is important that this is separated from the main body of the church to allow drinks etc to be prepared or cleared away without disturbing the service. This would be ideal for having drinks immediately after a wedding or baptism or holding a wake following a funeral. Without this separation we would be unable to heat this area independently of the main body of the church which would be very wasteful both financially and environmentally. In its own right, too, the gallery has other functions. For large services and events the gallery will provide much needed extra seating and it will also be an ideal place for singers and instrumentalists to supplement the musical forces in the nave below. Imagine, for example a soloist at a wedding or a funeral or trumpets during carols. The gallery has been raised since the earlier designs to give a greater feeling of space in the room below. We do not expect to find much under the floor. In 2016 an investigation was carried out under the supervision of the diocesan archaeologist which involved digging of a number of trial holes. This showed that when the floor was laid the vaults were filled in. At the same time the ledger stones (the engraved stone slabs in the floor) were re-positioned so that these now bear no relationship to the location of the original vaults. What are you doing about car parking? Car parking is a major issue for the whole village. We are actively working on a possible solution to provide parking for major church events but these discussions are still in progress. The proposals have been developed by an architect with a great deal of experience in working with churches and have been costed by a professional quantity surveyor. The project is projected to cost about £900,000 which includes the cost of restoring the mediaeval pews in the north and south aisles. Whenever work is carried out on a historic building one can never be sure of what will be found – especially when a floor is being lifted. What permission is needed and what is a Faculty? A Faculty is a licence given to allow work to be carried out on church buildings, their contents and churchyards. Although many Church of England churches are 'listed', they are exempt from listed building control, except in certain unusual circumstances (where a church is not primarily in use for worship, or where total demolition is involved). Alteration and change is instead regulated by the faculty jurisdiction which is a formal process that is equivalent to listed building control but also considers aspects of faith and worship which may be outside the expertise of local authority building conservation officers. A key part of the process is the public notice period of 28 days during which detailed information of the proposals must be made available. More information on the faculty process can be found here. What consultation has been carried out? The church has carried out a full consultation process which has been written up as a report and was available to view during the Faculty Public Notice period. There will be a lot of preparatory work required and a lot of care will need to be taken to minimise the impact on the existing structure as well as documenting the work. This will all add to the timescales. We are currently estimating that the church will be unavailable for services for between 9-12 months. Surely that number of chairs will take up a lot of space when not in use? The chairs we are looking at are robust but light and very stackable. 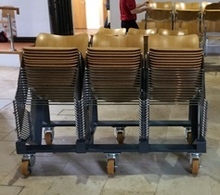 They come with a storage system that allows 60 chairs to be stacked on a trolley and moved out of the way with ease. Storage system for 60 chairs which can be wheeled away for storage.